The name tortas fritas translate to "fried cakes" or "fried pies." Though they resemble Native American fry bread, tortas fries are more like fried biscuits. Unlike fry bread, this dough is prepared with more fat (usually lard), like biscuit dough. 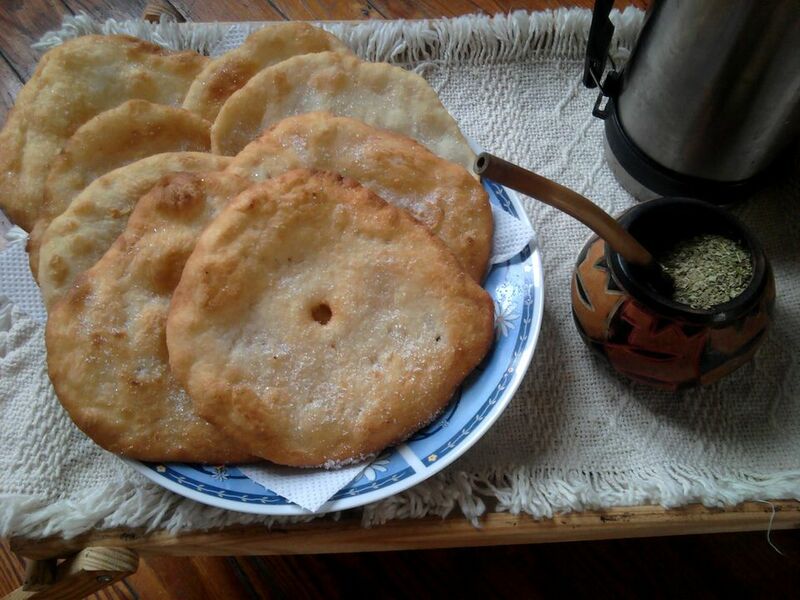 Tortas fritas are popular in Argentina and Uruguay, where it is traditional to enjoy them on a rainy afternoon with yerba mate tea. Tortas fritas are quick to make and a great treat for weekend mornings as well. In Argentina and Uruguay, tortas fritas are often served with dulce de leche or jam. They are normally fried in lard, but you can substitute vegetable shortening. Mix flour, salt, and baking powder in a bowl. Add 2 tablespoons butter and 2 tablespoons shortening or lard and mix into the flour with your fingers until well blended. Add milk gradually, stirring and then kneading gently as you go, until the mixture forms a smooth dough (add more flour if mixture becomes too wet). Roll dough out to about 1/4 inch thickness, and use a round cutter to make 3 1/2 inch circles. (Or separate dough into about 10 pieces, shape each piece into a ball, and flatten each ball into a pancake about 1/4 inch thick). Poke a hole in the center of each with your finger. Add enough vegetable oil (or melt enough shortening or lard) in a small skillet to have a depth of about an inch of fat, and heat until fat sizzles when the dough is added. Fry breads in batches until golden brown on both sides, turning them once. Drain fried tortas on paper towels and sprinkle with sugar while still hot.